In India, dhaba is a wayside eatery arranged on expressways. They serve virtually stunning tasty sustenance with the genuine stylistic layout. The nourishment served in dhaba changes from spot to place and district to locale. Each dhaba makes diverse dishes relying upon the accessibility of the crude material in that area. Be that as it may, whatever the district is wherever the dhaba is, the nourishment is flavourful, super heavenly and with a touch of effortlessness and genuineness. Regardless I recall my street trips with my family when we used to stop at dhaba's for dinner breaks, an affair despite everything I recollect. The dhaba styled egg curry formula appears to be the same what I used to eat years back in my childhood. 1. Peel as well as boil the eggs and the potato. 2. Marinate 1/4 tsp salt and turmeric powder with egg and fry in oil. 3. Heat oil in a medium hot pan. 4. Now you can add cumin seeds, and small cardamom, cinnamon stick, and bay leaf and stir it. 5. Add paprika powder, stir and then add finely chopped onions. 6. Decrease the heat to medium-low then cook onions for approximately ten minutes. 7. In between add salt and sauté after at regular intervals, so onions don't burn. 8. When onion becomes brown include ginger garlic paste and cook everything till the raw smell of ginger garlic is gone, and onion loses oil. 9. When you can see oil separates from the onions, include haldi, coriander, red chili and cumin powder and blend everything nicely. 10. Add a little water so that masala don't burn and mix it well. 11. Cook onion and masala till it loses oil once more. Now include ground dark pepper and slit green chili, and mix it thoroughly. 12. Now add boiled egg and potato and cook it with masala for a couple of minutes. 13. Now Add water as per the thickness of the gravy you like. 14. Increase the warmth to medium and heat up the sauce for 5-8 minutes. 15. After just about 8 minutes switch off the heat and include garam masala and dry mango powder. 16. 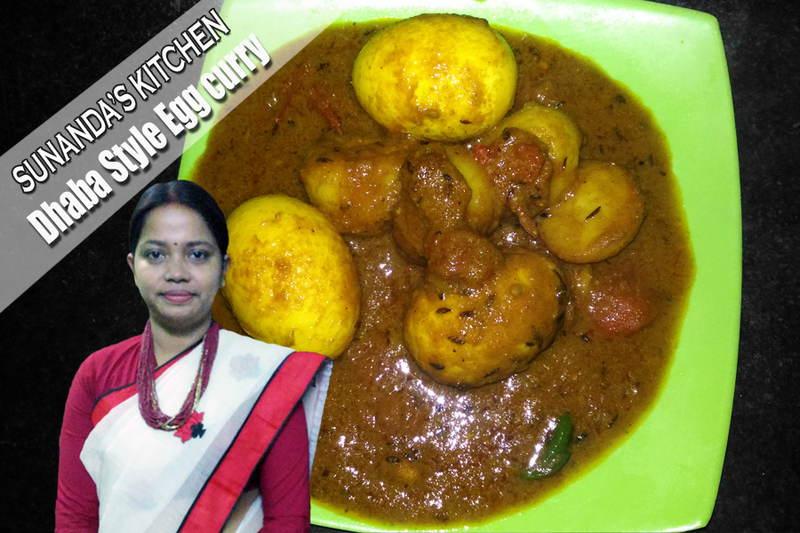 Egg curry is ready to be served. Serve it hot with steaming rice or delicate rumali rotis. 1. It is critical to pick the eggs before placing them in oil with the goal that they don't splatter Furthermore some curry sneak inside the eggs and make them more delightful. 2. If you feel red chili powder, pepper powder and ginger garlic gives you more heat don't hesitate to skip green chilies. 3. If you eat at dhaba's the curries are constantly of vibrant colour and to do the same I have included paprika powder or Kashmiri red chilies, on the off chance that you don't care for it don't hesitate to skip it.